← Wordless Wednesday: Chocolate is Good for You. Last Christmas, on our drive up to New Jersey from Florida, we stopped off overnight in the beautiful historical city of Savannah, Georgia. 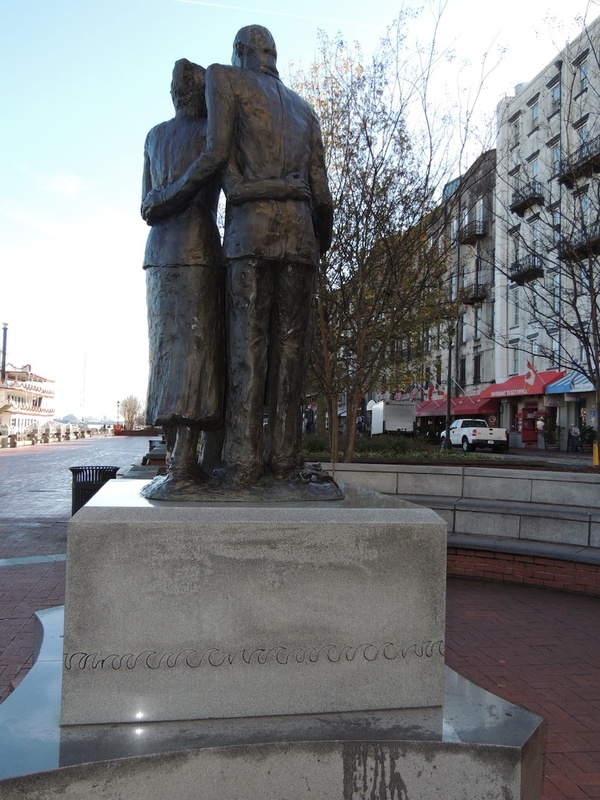 Our hotel was quite near to the waterfront, so we took a stroll down to River Street to see the boats, but were stopped in our tracks when we came upon this commemorative African-American monument, which stands just behind the Hyatt Hotel. 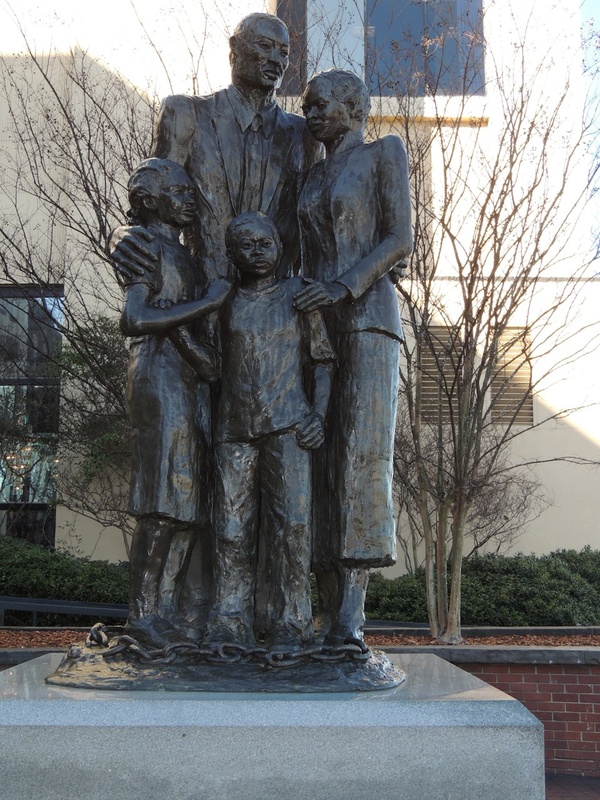 This bronze statue depicts a family of four, embracing one another after emancipation. The chains of slavery lie at their feet. The back view is also very emotive. 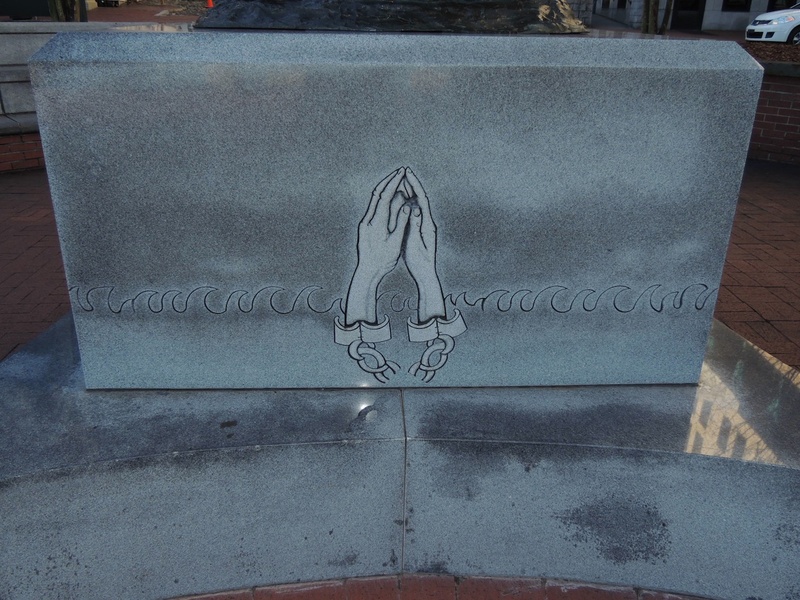 On the plinth are these two images. This is probably the most heart-touching statue I’ve ever seen, and I found it difficult to tear myself away and carry on with my walk. Such an emotive piece. I can only imagine how moving it must be to stand before it. Just today, I heard part of an interview with former President Jimmy Carter. He was speaking out against human trafficking and the slave trade today. The numbers were astonishing. Yes, It;s so sad that in this enlightened age, such evil practices are still being carried on. It was very moving indeed to see this beautiful statue and to read the inscription. Beautiful and moving …. the sad thing is that slavery is still massive problem today – human trafficking. People working in households for very low payment … children for under contractors to massive international companies … for pennies per day. It’s the most profitable crime industry after drugs. It’s really shocking, Viveka, that people still get away with such terrible exploitation, especially that of little children and young women. Read an report from FBI – US is the biggest market for human trafficking – terrible … its all down to the money – if we legalize prostitution, 70% of the human trafficking will disappeared, as they do in Holland and Germany. The girls pay tax and they go on monthly health checkups. Very compelling and so eloquently presented, Sylvia. And I agree with the other commentators – this was not so long ago and it’s something we must never forget. Thank you so much, Tahira. Very moving. I’ve read books and seen films about those days – and they all make me cry. So many people are suffering. Today, in Sweden, we have young girls coming in from the Baltics who in reality are made into slaves by scrupulous men – often from their own countries. Those men promise them a new and better life here – but slaves are what they become. Goose bumps after reading your words and watching the beautiful and proud statue. That’s exactly how I felt as I stood in front of it, Marion. Great shots. I have just finished reading a novel, “The Forgotten” about slaves being brought into Florida. A bit of fact, a bit of fiction…but statues, reminders, like these makes one wonder how much of each. Thanks, Woolly. Yes, we’ll never know the full extent of the suffering caused by slavery. So glad you enjoyed my sharing this with you, Christine. This indeed may be the most beautiful statue anyone will share with this challenge. Thank you. A perfect way to help people remember that the freedom of many was fought for. Yes it is, Colline. That’s why I decided to share it here. Respect, Sylvia! This is a great share. Yes it is, Della Anna. All three of those, Dianne. Reminds me of the movies,12 years a slave and another one which title I can’t remember now, it’s about Sandra Laing…anyways, this is a very moving statue indeed, Sylvia! Thanks, Aian. The movie was called ‘Skin’, and was set here in South Africa. 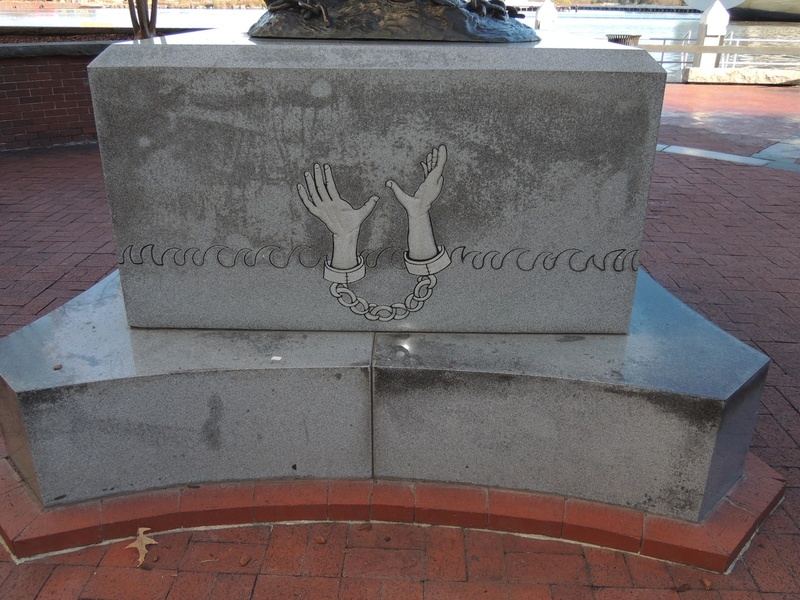 having recently seen the harrowing movie “12 years a slave” this statue resonated with me. I cannot understand man’s continuing inhumanity to one another even now. Such a pity there seems to be no end to this sort of thing. Great post, Sylvia. Oh, beautiful and sad at the same time… thanks for sharing your moment with us. +1 to all of the above comments! I recently saw this film too. It is a difficult film to watch and I could not believe the cruelty that so called human beings are capable of. And even now people from less developed countries are being trafficked and used as slaves. It is sickening. You’re so right, Maria. The statue is all about the amazing gift of freedom which should be the right of every law-abiding citizen on this earth. I haven’t seen the movie, Maria, but my daughter and family went to see it, and said that it was absolutely shattering. Love Savannah, you must have read the book Midnight in the Garden of Good and Evil? Savannah is really a terrific city, I should try to get down there. Thanks for the reminder Sylvia. maya angelou’s inscription is so moving and the statue is very powerful. hope we all learn from this dreadful past. thanks for sharing. You’re welcome, Lola. Yes, the statue sends out a very powerful message indeed. Anything to do with slavery does my head in and I get a bit choked up and hot under the collar when some people suggest it was less than the heinous crime it was, and that it still goes on in one form or another today. Thanks, Ark. I agree with you wholeheartedly. Thank you so much, Jardin. Incredibly moving Sylvia, and what a beautiful statue. Breathtakingly powerful. Yes it is, Sherri. I’ll never forget it. Another sad reminder of the inhumanity of man. If only one could say it has been put behind all of us. The most moving that I’ve ever seen, Sue. It is a reminder of a dreadful time. Unfortunately some people still live in slavery. Yes, a very sad truth, Debra.